Oil Infused 2 oz custom candle - a great spa or valentines day gift. Add some warmth to your next promotion with a fragrant and essential oil infused, soy wax candle inside a 2 oz. screw-top metal tin. Available in silver or bronze finish. Featuring a selection of scent options from our signature Zen collection. Available in the following blends: Focus (Peppermint & Pine), Immunity (Orange & Clove), Karma (Almond & Vanilla), Cloud 9 (Lemongrass & Sandalwood), Exhale (Eucalyptus & Peppermint), Invigorate (Grapefruit & Vanilla), Tranquility (Lavender & Chamomile). 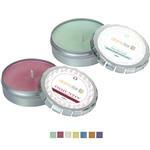 2.45" Diameter x 0.79" H. This is a quality candle at a promotional candle price. Available Colors: Focus (Peppermint & Pine), Immunity (Orange & Clove), Karma (Almond & Vanilla), Cloud 9 (Lemongrass & Sandalwood), Exhale (Eucalyptus & Peppermint), Invigorate (Grapefruit & Vanilla), Tranquility (Lavender & Chamomile). Soy Based. Oil Infused. Made in USA. Hand Poured. Full Color Imprint. Screw Top. Bronze or Silver tin.